I love TV. I really do. There seems to be a bit of a disconnect between books and film as opposed to television among a lot of people. TV has always been looked down on a bit, seen as appealing to the lowest common denominator by putting out broader, more simplistic programming. In a recent interview, Billy Bob Thornton said he feels that the tides have turned in that regard, and television is now the smarter, more sophisticated medium (you may be asking yourself Who gives a crap what Billy Bob Thornton thinks? and I couldn’t blame you, but that’s beside the point). In recent years TV shows have consistently raised the bar, starting in my opinion with The Sopranos, to the point that now some of the best stories being told are on the small (but ever growing in physical size) screen. In a way, it seems like it should’ve been that way all along. Movies are forced to tell you a story in two—or in Martin Scorcese’s case, three—hours, whereas a TV show can take its time, pacing the story however they want; the problem is they often drag it out for far too long. Enter True Detective, HBO’s new anthology series starring Woody Harrelson and Matthew McConaughey as a pair of mismatched detectives trying to solve the case of a serial killer in 1990’s Louisiana, and being interrogated about the case in the present day. That description kind of makes it sound like some terrible stoner buddy cop movie, but I assure you it’s anything but. The tension that builds between the two due to their differing world views is palpable. The acting and writing is excellent, the direction and cinematography are top notch, and it totally reminds me of the feeling I used to get watching The Sopranos—that I was watching something special, not just any old TV show. What makes True Detective even more unique is the anthology format: while the series is likely to be picked up for a second season, it’s already been set in stone that the current storyline with Harrelson and McConaughey will be wrapped up in this season’s eight episodes. When/if the series returns for season two, it will follow a similar format but have new lead actors solving a new mystery, in the vein of FX’s American Horror Story. If I had the power to control anything in the world of television, I’d like to see the anthology make a comeback in a big, big way. When you think about it, it seems like a win-win for everyone involved: the networks wouldn’t necessarily have to pay for full 22 episode seasons, as anthologies can be as few or as many episodes as its creators want. Which is good, since paying bigger name actors and directors would likely mean a bigger budget. Also, from the actors and directors point of view, they can work on a quality project but not be locked down for several months out of the year, leaving them open for movie projects or sunbathing in the south of France, or whatever it is actors do when they’re not working. There was a horror anthology on Showtime a few years ago called Masters of Horror (2005-2007) which, fittingly, showcased legendary horror directors behind the camera for one episode of the show apiece. My favorite episode of the series was titled Incident On and Off a Mountain Road, directed by Don Coscarelli of Phantasm fame and adapted from the short story by master of horror in his own right Joe Lansdale, but I digress. My point was that getting big names (be they actors or directors) for shorter commitments (and with definitive endings to the stories in sight) can benefit everyone. Networks just love dragging shows out past their prime; it’s disappointing. My DVR is like a TV graveyard for once-promising shows that my wife and I lost interest in. Falling Skies. Revolution. Under the Dome. Even The Walking Dead, the one I would’ve thought I’d watch until the final frame. Having no end in sight means they have to stretch the shows to the point that I just don’t care about them anymore. 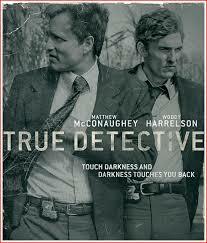 But I can tell you this: I will be watching every episode of True Detective, and savoring every moment of it. PS—I type this on Sunday afternoon, a few hours after hearing the news of the passing of Philip Seymour Hoffman. There isn’t really anything I can say about him that someone else hasn’t already said; he really was a brilliant actor, and I never saw him in anything where he wasn’t “on,” as they say. But rather than lament on the shocking loss, I’ll recommend one of his movies. Everyone is mentioning Capote, for which he won the Oscar, as well as Boogie Nights, Magnolia, The Master, and of course Hunger Games. 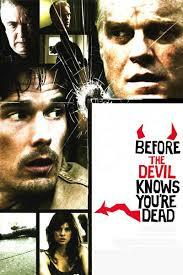 But there’s one that has flown inexplicably under the radar ever since its release: Before The Devil Knows You’re Dead (2007) is an excellent thriller starring Hoffman and Ethan Hawke as brothers who aren’t as smart as they think, and find out just how incompetent they really are when they try to pull off a heist of their parents’ jewelry store and botch it something awful, with heartbreaking consequences. It costars Marisa Tomei and Albert Finney, and also happens to be the final film from legendary director Sidney Lumet, who went out on an extraordinarily high note with this film. Give it a watch and I’ll bet you like it. It’s a tragic reminder of yet another talented actor gone too soon. This entry was posted in TV and tagged anthology, Before the Devil Knows You're Dead, Drama, HBO, Masters of Horror, Matthew McConaughey, Philip Seymour Hoffman, Sidney Lumet, Television, True Detective, TV, Woody Harrelson. Bookmark the permalink. There were so many roles I forgot about…Hard Eight, Almost Famous…I never saw Pirate Radio, I’ll have to check that one out. Between him and James Gandolfini it’s been a rough time for fans of good actors.